Stunning coral reefs, uninhabited cays, mangrove flats and miles and miles of wild, unexplored forests, the Abacos are an island hoppers paradise. One of the world’s top boating and sailing destinations, these charming islands are surrounded by the calm turquoise seas. Great Abaco and Little Abaco are the “mainland” islands stretching 120 miles long, with small barrier islands separating them from the Atlantic. This makes for a perfect spot to drop anchor and relax on Nirvana calm waters. Swim with stingrays in water so crystal-clear blue you can’t miss them. Discover gorgeous coves and relax on beautiful beaches tinted with pretty pink sand. Savour a fresh papaya breakfast or munch on conch salad in Marsh Harbour the main island of the area. Explore the best beach bars and seafood straight off the boat and onto your plate! Head out to Treasure Cay or Man-O-War Cay, where you'll find a bit of history, quaint towns and golfing. Or go island hopping toward any number of nearby islands. 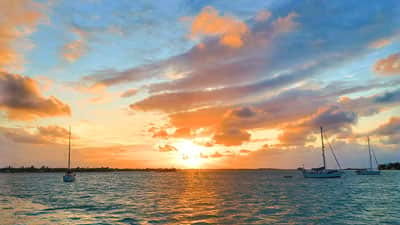 Wherever you drop anchor, make sure you watch the beautiful sunset of Exumas with classic pink and orange Bahamian pastel skies. June, July, and early August are the best months for boating.